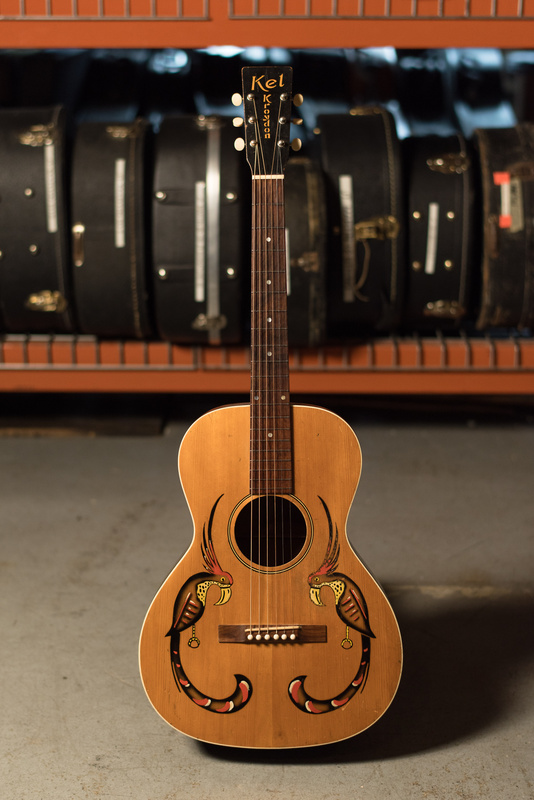 Kel Kroydon, an acoustic guitar brand favored by Wilco’s Jeff Tweedy, appeared as a budget line from Gibson in about 1929, then disappeared two years later giving the brand an air of mystery. Eight decades later, it’s hard to find a Kel Kroydon guitar in the wild, and information about the brand is scant, but the guitars have developed a small but loyal following along the way. As a way to help the company navigate its way through the Great Depression, Gibson began offering budget instruments under several brands in the late 1920s, with Kel Kroydon among the first. Other brands, including Kalamazoo and Recording King, were made from 1926 to 1970, according to Fox-Guitars.com, a vintage instrument dealer. The Kel Kroydon brand, featuring guitars, banjos and mandolins, first appeared in 1929 in its KK line of acoustics, according to the book “Spann's Guide to Gibson 1902-1941.” The KK-1, the KK-2 and KK-3 guitars, along with a KK-11 banjo, appeared in 1930, with the banjos and the KK acoustic line again in 1931, with the KK-1 listed as a tenor guitar. Gibson discontinued the brand after 1931. Fox-Guitars.com dates the debut of Kel Kroydon instruments to early 1930, with two guitar, two banjo, and two mandolin models. About the same time, Gibson also introduced a line of toys, including wooden sailboats, under the Kel Kroydon brand. A J.W. Jenkins Sons Music Co. catalog from the era lists two Kel Kroydon acoustics for sale, a BK1 for $20 and a BK2 with tropical parrots on the spruce top, identical to Tweedy’s KK1, listed for $30. The catalog trumpeted the guitars for “exceptional” build materials. “A truly fine guitar at a moderate price,” the catalog said. Like some other Gibson budget brands, the Kel Kroydon brand survives today with a line of banjos made by the American Made Banjo Company.